January can be a tricky month, with all the festive fun over and another year stretching out ahead of us - not to mention Blue Monday lurking around the corner, allegedly the worst day of the year! With that in mind, I thought I'd share a fun app this Friday, one that hopefully will bring some laughter back into your classroom, for both you and your students; I don't think I've ever managed to use this app without it ending in hilarity. This week it's time for (the almost legendary) Kahoot! First off let me just clarify something - I've not forgotten how to use grammar, Kahoot! does indeed have an exclamation mark after its name (!). Kahoot! is basically a quiz game, you set-up a quiz on the whiteboard and students use mobile devices such as laptops, tablets or mobiles to answer the questions. Questions have four answers, and students simply press the colour button that matches their answer as shown on the whiteboard. There are other game modes available, such as discussion or survey, but quiz is by far the most popular. Students can answer individually or work together as groups, and you have lots of customisations available, e.g. randomising questions, automating timing, generating nicknames automatically (useful for classes who might choose something inappropriate), celebrating 1st, 2nd and 3rd places, etc. 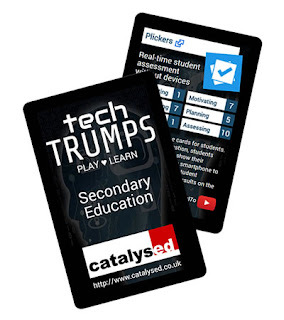 As you'll see from the Tech Trumps® card above, Kahoot! is particularly strong on Investigating, Motivating and Assessing, so let's look at those aspects in particular. Kahoot! might not initially seem a good choice for Investigating, i.e. finding and curating information about a topic. After all it is just a quiz game. But thanks to their open policy there are thousands upon thousands of games available for you to choose from, all nicely organised and collected into subjects to make them easy to browse. What's more you can duplicate those that you find, and then customise them to suit your own needs. Bear in mind that you can also get your students to create quizzes, which encourages them to evaluate what they know, and contrast that with what they do not know, in order to create suitable questions. From a Motivating perspective I think it's fair to say that Kahoot! is probably the most motivating app I've ever come across. The way the app gamifies quizzes, by using time and peer pressure, really helps to get students engaged with the questions. There is some debate whether or not this merely gets students engaged, as opposed to actually learning, but provided you integrate a Kahoot! quiz into your lessons as part of a well-structured series of learning about a topic then this shouldn't be a problem. Kahoot! themselves have also released new game modes (e.g. Jumble) and different options that can downplay some of the excitement and increase the need for reflection from students as opposed to simply speed. As you can imagine, Kahoot! can also be a powerful tool for Assessing your students' knowledge. Though it may perhaps lack some of the underlying data that you can get from apps like Socrative, students themselves can both see and download how well they've performed, and you can gauge how well students understand the topic of your quiz from their answers during the class. A useful trick is to set the quiz to run itself, automatically proceeding from question to question, so you can move around the classroom and pay attention to the types of answers students are giving. That way you can focus on your students, rather than have to worry about triggering the next question. So that's about it for Kahoot! - probably the most fun you can have in the classroom, and still get some learning done at the same time. Do you have any ideas for using Kahoot! that you'd like to share? Please feel free to add them in the comments. 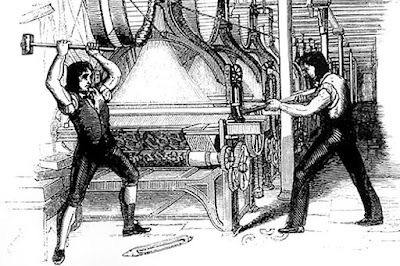 Looking for more edtech? 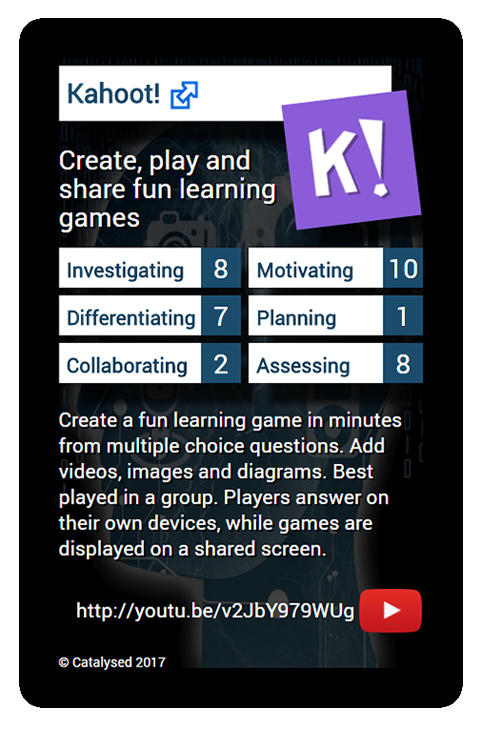 Head over to http://techtrumps.co.uk to see Kahoot! and a host of other apps for teachers. You can also buy your own pack of cards for only £8.99 (plus P&P) direct from Amazon.co.uk (also on Amazon.com for my US readers). With your own pack of cards you can browse at your leisure, or play a game with your colleagues. Have fun, and discover new apps at the same time. As ever, if there's anything in particular you'd like me to cover here please let me know in the comments. Until next Friday!